Date Bread w/ chopped pecans – a perfect holiday sweet treat! This perfectly sweet, soft, and moist bread is made without any butter, oil, dairy, refined sugar, or gluten. Ever since I met my husband, Date Bread has been a part of our holiday tradition. My mother-in-law makes it every year and I always swoon over it. One piece quickly leads to another and another. I just can’t stop myself – it’s so good!! This year, I decided I would try to make a vegan version. After so many trials I lost count, I have a winner! Trust me, it was worth all the failed attempts to get here. I think you guys are going to love this! When I set out to make my vegan version of date bread, I wanted to make sure I captured the texture, as close to possible, to my mother-in-law’s bread. Hers is dense, but not in a heavy way, just in a gooey delicious date way…it’s very soft and moist. There is very little crust because she bakes hers in cans. I looked this up and it’s actually quite a popular thing. Who knew? So, while my version does form a crust on top, it’s still quite soft. And I put in a hefty dose of chopped pecans just as she does. I also found that a lot of date bread recipes soak their dates in coffee. My mother-in-law’s recipe didn’t call for that, so I didn’t do it either. Through my numerous trials, however, I did find that just a hint of molasses really deepens the flavor of the dates, but without the caffeine kick and with an added boost of iron. Did I mention that I went through many trials of this recipe? That “springy” texture is just what I wanted and it worked out perfectly! Not all gluten free flour mixes are the same, so I can not guarantee results with any other brand. Bob’s Red Mill has kindly offered to let me provide you with a coupon to ensure your holiday baking turns out just perfectly! 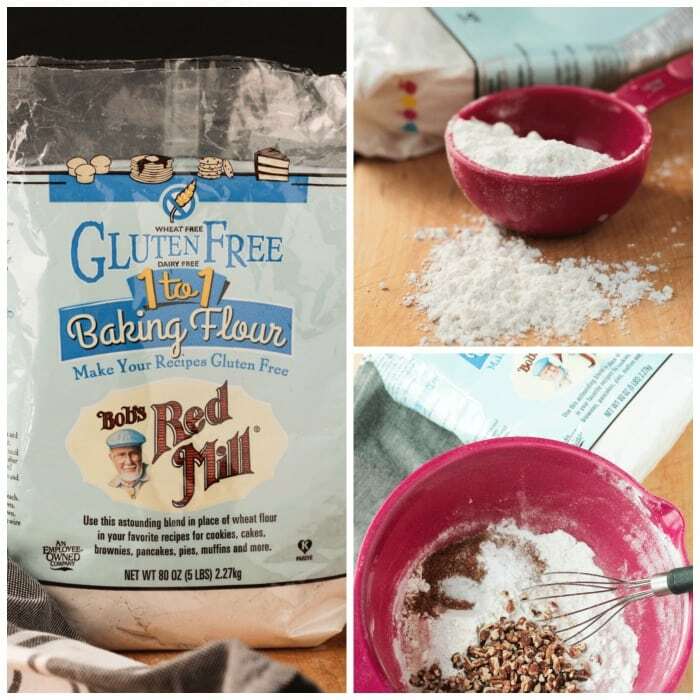 I love Bob’s Red Mill so much and use their products all the time. Check out these other recipes I created using these awesome products: Gluten Free Thumbprint Cookies and Baked Oatmeal Muffins w/ Cranberries. 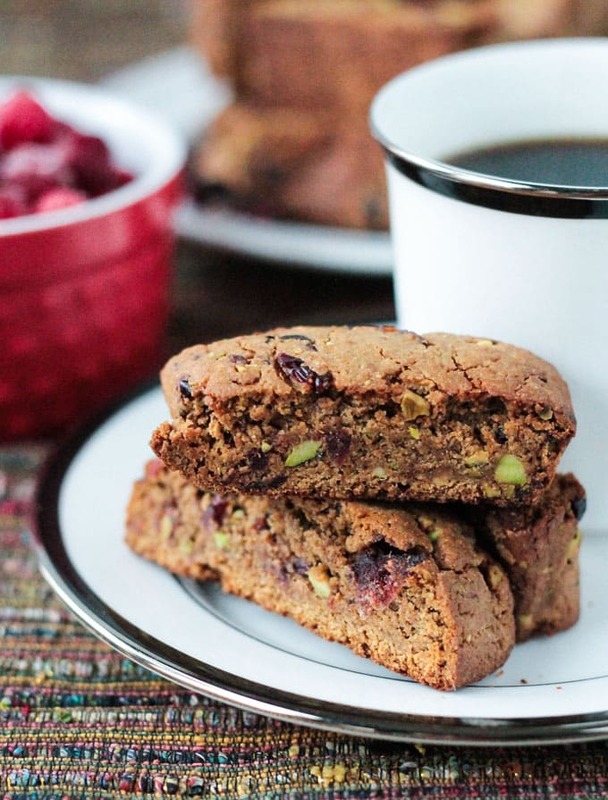 Obviously, this Vegan Date Bread is the perfect sweet treat for any holiday function. But, it also would make a great gift for neighbors, teachers, friends or family. Tie it up with a pretty red bow and stick it in a paperboard bakery box. Delicious homemade gifts that say “I appreciate you” – done! I hope you guys love this Vegan Date Bread as much as we do. If you try it, please come back and leave me a comment below with your feedback and star rating. You can also find me on social media. Snap a quick pic and be sure to tag @veggie_inspired and #veggieinspired so I’m sure to see it! Perfectly sweet, soft, and moist Vegan Date Bread made with no eggs, no oil, and no refined sugar. Perfect for the holidays and gifting to neighbors, teachers, friends, or family. Preheat the oven to 350 degrees F. Lightly spray a 6-cavity mini loaf pan with cooking spray and set aside. In a small bowl, pour the hot water over the dates and let them soak while you prepare the batter. In a medium mixing bowl, whisk together the flour, sugar, baking soda, baking powder, and salt. Stir in the chopped pecans. In another mixing bowl, whisk together the aquafaba, almond butter, molasses, apple cider vinegar, and water from the dates. Pour the dry ingredients into the wet and stir until combined. Stir them dates into the batter. Spoon the batter evenly into each cavity of the loaf pan. Bake for 25-28 minutes, until a toothpick inserted into the center of a loaf comes out clean. Let cool in the loaf pan on a wire rack for about 5 minutes. Remove the loaves from the pan and continue to let cool on the wire rack. Nutrition facts calculated assuming 2 servings per mini loaf. Absolutely love your creative idea with Vegan date bread! Can I post it on my blog? Thanks for sharing! Thanks, Julia. You may post a link to my blog post, but please do not post the recipe in full. What can you use instead of aquafaba? Thanks! Is there a reason you don’t want to use the aquafaba? I find it really is the best egg replacer – making baked goods fluffy and soft. That being said, you could try an equivalent amount of flax egg..or maybe another egg replacer. I can’t guarantee your results will be exactly the same though as I haven’t tried it myself. Let me know what you decide. Flax egg is perfect! Thank you!!! My stomach doesn’t do well with aquafaba and garbanzo in general. Oh, I see. Let me know how it turns out with the flax egg! It turned out amazing!!! Super soft, flavorful and oh, so good! Thank you so much! I used raisins instead of nuts and we love it. There were a few times that I did not have Aqua Faba and used the flax eggs and a bit more plant based milk and the results were excellent! Oh, and I also added some cinammon and swapped out pecans with walnuts and that was a great addition. Thank you, Chris! So glad you liked it. Glad to hear flax eggs work too! Just made this recipe as one large loaf, and it turned out great! Increased the cooking time to about an hour, and it rose beautifully. Hi, Melissa! So glad you loved it! And great to know it worked as a full loaf! I’ve actually never done it that way because I love to give it as gifts and the smaller size is perfect for that. Thank you for your comment! Vegan date bread is pure combination of taste, I like a balanced diet! I’m seriously so inspired right now. I need to add cinnamon to recipe and it would be perfect. Thx for sharing Jenn! I can tell you for certain that it is, indeed, delicious for breakfast! 🙂 Thanks, Melissa! I hope you guys love it. I love quickbreads! This looks delicious! Dates and Pecans sound like a great quick bread. I’m always trying to find a good gluten free bread and this one sounds perfect. Thanks, Ginny! Gluten free can be finicky for sure, but this worked out really well! These little loaves are adorable and so perfect for a sweet holiday gift! I can’t believe I’ve never had date bread before, but I’m 100% sure I’d love it – especially with pecans – I love pecans in baked goods. I’m so intrigued by baking in cans??? What a crazy idea! But since I’m a huge fan of crust, I’m guessing your version is more up my alley 😉 I actually have some mini loaf pans begging to be used…I think I’ll have to try this for my family! I’m surprised at how many people have never had date bread. It’s definitely a lovely holiday treat. Baking in cans is an old tradition that started when metals were hard to come by. People would clean and reuse cans instead of buying specialty baking pans. Obviously before we knew about the hazards of BPA! I hope you guys love this Date Bread! I never heard of baking in cans! That’s a really cool idea. This bread looks delicious and is perfect for the upcoming holidays! I know, I had no idea it was such a big thing. Thanks, Mary Ellen! Your date bread looks amazing! I recently bought this flour. I can’t wait to try your recipe! Oh great. I hope you love it, Amy! Thanks! I love this recipe, dates are the best! I love the way you tied it in a ribbon too, the perfect holiday gift from the heart! I LOVE dates and date bars but never thought to try date bread! I cannot wait to try this! 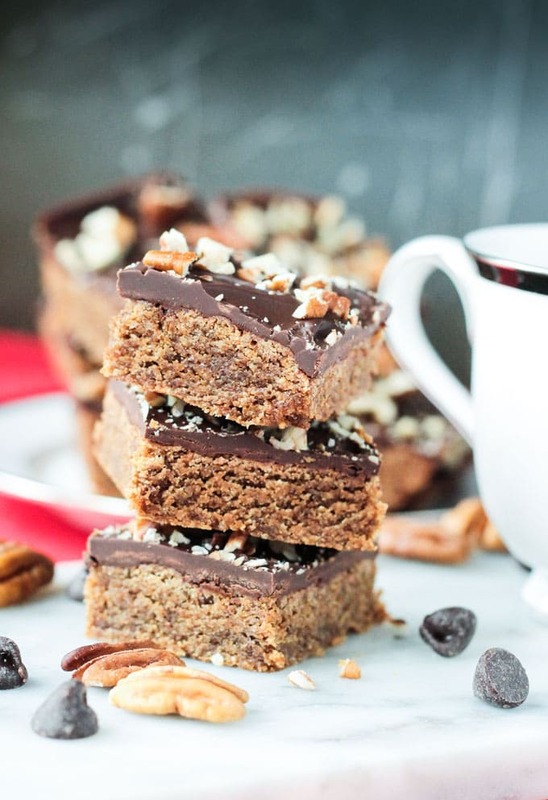 Oooh, date bars sounds fab too! Thanks, Sarah! These are so pretty Jenn! I really like that new-ish 1:1 flour. It is so much more versatile than a lot of the old-school gf blends. This looks so delicious! Perfect for the holidays! this looks great. Could I use a flax egg instead of the aquafaba? I rarely buy canned chickpeas so I don’t have any available. If so, how many “eggs” are in the recipe? thanks. Hi, Jacquie. Flax won’t give the bread the rise that aquafaba does. You can find organic chickpeas at Walmart for less than $1. I think it’d be worth the buy here. Not saying it won’t be good with flax, but it will be a different texture for sure. It’s about 2 “eggs” for this recipe. This vegan date bread looks so delicious! Such a great idea for food gift giving! I love gifts that I can eat. So much more practical, don’t you think?! 🙂 Thanks, Lindsay! This looks amazing! I LOVE dates, but have never even heard of date bread. Must. Try. Really? Maybe it’s just a midwest thing? I hope you get a chance to try it. Thanks, Kerri! I’ve never had date bread, but it looks delicious! I could go for a slice right now. I’m surprised at the number of people who have never had it before. Here I thought it was pretty common, but maybe just in the midwest? Thanks, Dianne! Hi Jenn! your photos & this date bread both I love very much. Its sounds so delicious, very healthy & best bread you made! so sweet. Oh, thank you so much, Rony! Let me know if you get a chance to make it. You most welcome Jenn! Of course I`ll let you know & make it soon. Have a great time. I don’t know what I love more, this bread or your photos! I can’t believe you’ve never had date bread! Now, you need to come up with a version that is ONLY date sweetened!! This looks so much better than those boxed holiday fruitcakes! Oh, for sure!! (Though my father-in-law loves those boxed fruit cakes!) LOL! I love using dates to sweeten baked goods naturally! this sounds so delicious! Thanks, Laura. There is definitely sugar in this bread also, but only unrefined. Hope you love it. I’ve never tried making bread with dates, I love the idea. It sounds delicious and festive, but not a fruit cake! Thanks, Amanda. Definitely not fruit cake! These sound lovely, Jenn! What a wonderful holiday bread!! Ohh that looks delicious! I love that you have a “food tradition” in your family, I think we need one too. And trial and error is usually the way the best recipes are created! I’m very curious about date bread, will have to taste it some time… Love the photos! Thank you so much, Vivian! I love the tradition too and look forward to it every year. I hope you give it a try. Have a great week!